You’re using social media. You’re getting followers, likes, engagement, but what is it good for unless it is driving sales? You might use social media marketing for many different reasons. Maybe you want to increase brand awareness, maybe you want to improve your relationship with your audience, or maybe you want to drive traffic to your website. But there’s one thing they all have in common – no matter which objective you set out to achieve, and that is the fact that all of these objectives are based on one end goal. To drive more sales. Yes, you want to build a better relationship with your audience, but in turn, this will increase their trust in you which will ultimately increase the chances of them becoming customers. Yes, you want to drive traffic to your website, but why do you want to do it?To drive sales of course. To drive sales of course. Whether you’re “unintentionally” or intentionally using social media to drive sales, you need to have a sales funnel that actually sells. All businesses’ end goal is to sell more. And to be able to do so well, on social media, you need to develop your own sales funnel. Therefore, that’s exactly what we’ll talk about in this article. In this article, I’ll teach you How To Create Your Social Media Sales Funnel That Actually Sells. What is a funnel and what does it mean? 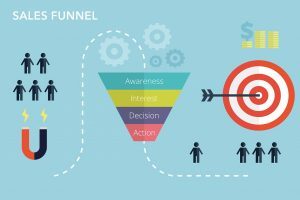 Well, the word funnel is used to describe a buyer’s journey – from first becoming aware of a brand’s existence to ultimately buying from you, or taking some form of action. By developing your own sales funnel, you’ll better understand how you can attract people to your funnel, make their funnel experience the best it possibly can to ultimately get them to complete all steps. The thing with a social media sales funnel is that the customer has to follow every single step of the funnel in order to become customers of you. In other words, you cannot neglect or ignore certain steps within your funnel. You need to include all to ultimately drive a sale. You’ve probably seen the traditional sales funnel that gets narrower the closer you get to the conversion and sale. No matter what the sales funnel look like, they all have two things in common, and that is that they include a first step, which is to increase awareness in order to make people aware of the brand, and then a step that converts them into customers. Before you can convert your social media audience to customers, you need to make them aware of your brand. If people aren’t even aware that your brand exists, you need people to become aware that your product or service exists. It’s self-explanatory. How can they buy from you if they don’t know about you? To attract people to your business, you need to be interesting enough to convince them to stay and then proceed to the next part of your funnel. In order to sell, you need to get people interested and curious about your brand – and this is the biggest challenge for marketers. If people aren’t feeling like you have something to offer, will they buy from you? Last but not least, is the last step in the social media sales funnel. It doesn’t matter how much a person wants to buy something unless they take the step to actually buy it. You can get endless of people to the last part of your funnel, but if all of them stay there, you’re doing something wrong. 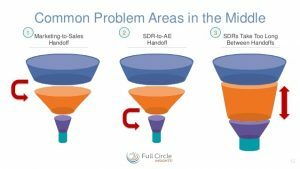 If that is the case, you aren’t fulfilling all parts of the funnel, and this brings me to the thing that we discussed earlier: all steps of the sales funnel are vital. 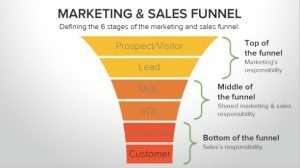 There’s no doubt that the four steps of the sales funnel are important. But how do you actually put this into action and implement them into your social media strategy and efforts? How do you actually start generating more sales, or sales at all, with the help of it? There are different theories about the sales funnels and different words and ways to describe it, but something that all unites them is that you want to make your customer’s journey from A to B as pleasant as possible. Of course, it’s a bit more complicated than that, so to help you develop a well-working sales funnel for your social media strategy, I’ve prepared some questions for you to answer regarding each step. What is vital for a successful sale funnel is that you thoroughly set up every single part of it. Some brands are only focusing on the parts of the sales funnel that they’re good at and ignore the rest, but this makes your sales funnel terrible – no matter how good the part you’ve been working with is. Because if your funnel isn’t smooth all the way through, people will get stuck in it. You might have an incredible website but if you’re not paying attention to the first part of the funnel which is how your customers are going to find you, you will probably still struggle with generating any results. People can’t go from being completely unaware of your brand to buying from you instantly. They have to pass the other parts first! 1. Awareness – How will your customers find you? As all parts are equally important, I cannot say that this is the most important part. However, it’s no secret that if you aren’t making people aware of your brand’s existence, how will your customers ever find you? With social media, you have hundreds and hundreds of different ways you can promote your brand, and you can even use several of them at once. You just need to figure out which social platforms are for you and what social strategy you’re going to use to increase the number of people who know about your business. 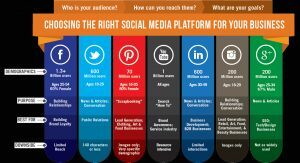 You should most definitely select several of the social media marketing ways and platforms, but something you shouldn’t do is stretch yourself thin so that you end up spending a little time here, a little time here, generating average results on all the places you’re at – rather than generating astonishing results on all. To get people to find you, using social media, there are both paid and free methods. What’s more, how you’re going to do this depends to a large extent what type of brand you are and who your target audience is. Pinterest, for example, might work for a brand that has a target audience of women, but for a brand that only has males, there’s a risk that it won’t generate equally great results. When planning on ways you can get people to find you, having a customer persona will be extremely helpful and something you shouldn’t neglect. This will allow you to reach them better, know where your ideal customers are spending their times and how you can reach them. The point with your social media sales funnel is to ultimately drive sales, but it can be worth mentioning that you also want to focus on all the parts of the funnel rather than just getting people inside of it. If you would only focus on driving sales, you’d end up only working with the last part of the funnel, but that would mean that you would struggle with getting people in it in the first place. I’ll get more into detail on why it’s important to consider all parts of the funnel, and why all of them are necessary, but you want to think about what social media tools are good for what objectives. In other words, prioritize the social channels and tools your audience is already using and that helps you achieve your goals. 2. Interest – What are you going to do to stand out from the crowd? Social media is a very noisy place with millions and millions of pieces of content being shared every hour. There’s no doubt that the competition is tough, and to stand out from it, you need to put great emphasis on being unique and doing things that people aren’t doing. Just sharing regular posts and hoping that people will find you just won’t cut it. You need to do something unique, be controversial, be personal, or do anything else that people don’t expect. Just look at Dollar Shave Club. They created a fun and edgy YouTube video that went viral due to its uniqueness, and the brand’s brand awareness increased like a rocket. So much so that Unilever eventually bought DSC for 1 billion. Wow. Now, I am not saying that it was just because of one YouTube video, but I am saying that they were very smart in their marketing – and found a brand voice that resonated with their target audience and got a huge spread from the rest of their videos and social media activity. This is something you need to do too. You need to find something that makes your brand unique and appealing and then go with that. You also need to develop a brand message and personality that resonates well with your audience. This will allow you to better reach people from your target audience that are most likely to buy from you. 3. Conversion – How will you convert your followers/audience into customers? Now, by getting your audience down your sales funnel, in other words by following the steps above, you’ve come a long way and you’re getting close to a conversion. But how are you going to convince them to buy from you? How are you going to get them to step over the last little ledge and into your brand’s customer list? Encourage newsletter sign-ups to stay in contact with them and remind them of your brand’s existence. You can also send them special deals to further increase urgency. Create social media contests with purchase incentives. The opportunities are endless, really, so it’s impossible to list them all. Only your imagination sets the limits. How are you working with your sales funnel? What experiences do you have with creating an effective one?